Serverless and microservices reshape the application stack into something that looks like a swath of stars in the sky. How do you find a slow, misconfigured component in this interconnected galaxy? I’m hearing that IT infrastructure is dead. And who needs it anymore, really? The future is about moving up the stack to microservices and serverless technology, as we continue to abstract, embed and automate away all the complexities of explicit infrastructure layers, such as storage arrays and physical servers. On-premises, Capex-style IT is shrinking, while rented and remotely managed hardware and cloud transformation set new standards for modern IT. All the cool kids use end-to-end orchestration, advanced machine learning, real-time management data streams, microservices architecture and insanely scalable container environments. 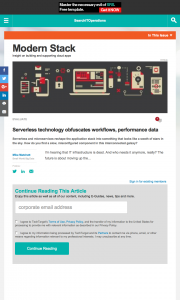 And now we even have serverless computing, sometimes called function as a service (FaaS). But can we have computing without the server? And where did the server go? I tend to bravely charge in, and, after a lot of at-bats with this question, I’ve got the first 25 seconds down: “It’s like running all your favorite applications and storing all your data on somebody else’s servers that run somewhere else — you just rent it while you use it.” Then I lose them with whatever I say next, usually something about the internet and virtualization. The same is mostly true with serverless computing. We are just moving one more level up the IT stack. Of course, there is always a server down in the stack somewhere, but you don’t need to care about it anymore. With serverless technology in the stack, you pay for someone else to provide and operate the servers for you. We submit our code (functions) to the service, which executes it for us according to whatever event triggers we set. As clients, we don’t have to deal with machine instances, storage, execution management, scalability or any other lower-level infrastructure concerns. 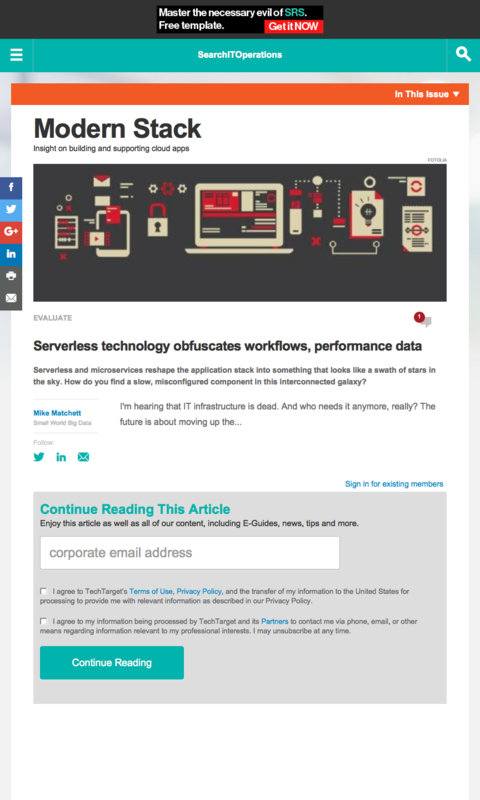 This entry was posted in Published Articles and tagged AWS Lambda, Functions as a Service, SearchITOperations, Serverless computing by Mike. Bookmark the permalink.